1 Member A views the duty roster and decides that he or she needs to swap a duty. 2 Member A identifies Member B as a likely candidate to swap duties with and sends a swap request using the Duty Swap panel next to the roster. 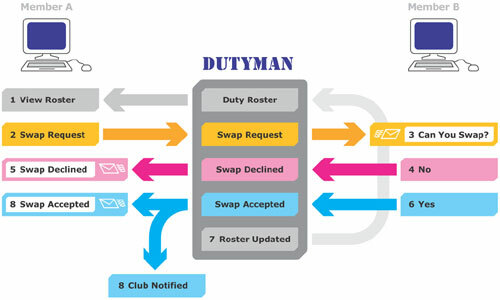 3 When DutyMan receives the request it sends an email with details of the proposed swap to Member B. This email contains two links back to DutyMan - one to accept the swap and one to decline. Member A can request swaps with further members who also receive emails. 4 If Member B does not wish to accept the proposed swap he or she clicks the decline link. DutyMan advises Member A by email. 5 If Member B can accept the swap he or she clicks the accept link. 7 ... emails Member A to say that the swap has been requested. This email is copied to the duty co‑ordinator and, if applicable, to those in charge of the swapped duties.